Parinda Hotel provides free shuttle service to the main road, less than a 5-minute drive away. 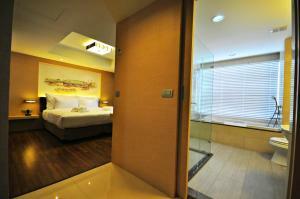 It offers comfortable rooms with air conditioning and free toiletries. The hotel has an outdoor pool and a fitness centre. Free Wi-Fi is available in the entire hotel. The popular Terminal 21 Shopping Mall is only 1 stop away from Nana BTS Skytrain Station. MBK and Siam Paragon shopping malls can be reached within 15 minutes via skytrain. Suvarnabhumi International Airport is a 35-minute ride away. 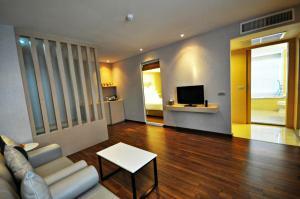 Modern rooms are equipped with a 40-inch flat-screen TV, a seating area and an electronic safe. Tea/coffee making facilities, a fridge and a hairdryer are provided. En suite bathrooms are fitted with a bathtub and shower facilities. Facilities and services offered include luggage storage, laundry and on-site parking. myFAV Café & Restaurant offers a tasty selection of Thai and international a la carte dishes. Please note that the free shuttle service from the hotel to the main road is available from 09:00-21:00 hrs. From there, Nana BTS Skytrain Station is a short walk away. A security deposit of THB 2000 per room in cash or credit card is required upon arrival for incidentals. This deposit is fully refundable upon check-out and subject to a damage inspection of the accommodation. A damage deposit of THB 2000 is required on arrival. This will be collected as a cash payment. You should be reimbursed on check-out. Your deposit will be refunded in full in cash, subject to an inspection of the property. Air-conditioned room features a seating area, a flat-screen cable/satellite TV and a refrigerator. Includes a safety box, slippers and a hairdryer. 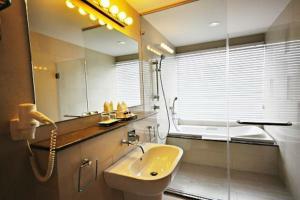 En suite bathroom comes with free toiletries, a bathtub and shower facilities. Rate: THB 2107.81 ... THB 7000.00; select dates below to get current rates. This suite features a bathrobe, air conditioning and sofa.